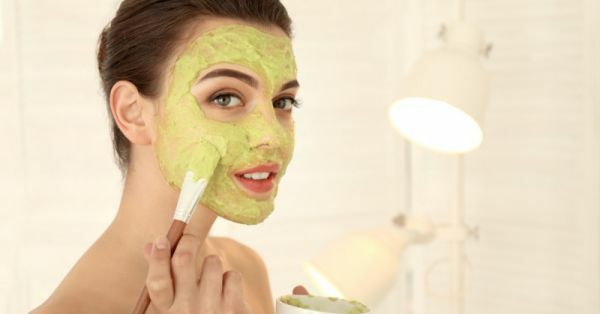 When it comes to getting a facial done, there are two types of women out there - one type who seeks help from skincare professionals and the other, who prefers to get it done by themselves at home. If you belong to the latter group, then this article is for you! Getting a facial done at home not only saves money but time as well. Before learning how to do one, it's important to know what it is first. Shall we, begin? A facial is basically a skin treatment that involves cleansing, exfoliating, extraction, exposure to steam, use of creams, lotions and facial masks. It's later followed by a massage. The aim of a facial is to improve your skin's complexion, keep your pores squeaky clean and nourish your skin. Since the massage boosts blood circulation, it also leaves you with a healthy glow. Increases blood circulation and oxygen flow. Relieves stress and clears your mind. Cleans skin from oil buildup, toxins, dirt and bacteria. Makes skin look healthy and youthful. Gives skin a radiant glow and balanced complexion. Before cleansing your face, tie your hair up into a bun or a ponytail. If you have short hair, wear a hairband. You want to make sure that your hair does not make contact with your skin during your facial. The skin on your face is delicate. You must wash it using a mild cleanser and lukewarm water. When washing your skin, don't directly apply the product. Lather it up on your fingers first and then apply it on your face. Remember to massage your face in circular motions so that product gets evenly spread and removes all the dust, makeup residue, oil and grime from the skin. Another way to remove makeup is using micellar water or good old coconut oil. 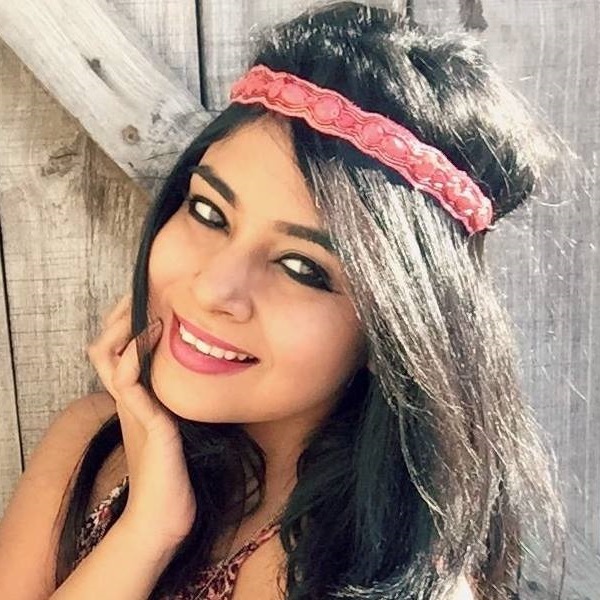 These two methods will remove every bit of your makeup without taking a toll on your skin. Exfoliation is probably the most important step of a facial. It helps unclog your pores by getting rid of dead skin cells. You can either use a scrub or make one at home using natural ingredients. Scrub in circular motions to keep pores squeaky clean. 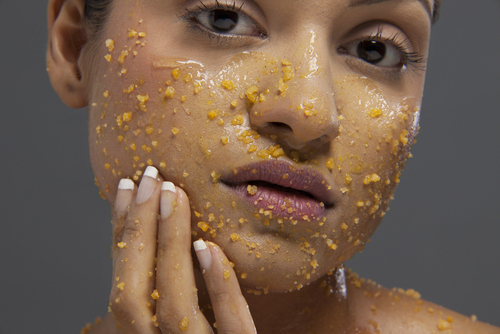 Don't know how to make an exfoliating scrub at home? These 3 recipes will help. Step 1: In a bowl add 1 teaspoon of sugar. Step 2: Add 2-3 drops of water. Step 3: Add 2-3 drops of tea tree essential oil. Step 4: Use a toothpick to blend the ingredients. Step 5: Apply to your face and rub the scrub into your skin. Step 1: In a plate, pour 1 tablespoon of honey. Step 2: Add half a cup of oats. Step 3: Mix both the ingredients well. Step 4: Add 5 drops of lavender oil. Step 5: Give it a good swirl and apply the scrub to your face. Step 1: Take a bowl of coconut oil and add some brown sugar to the mix. Step 2: Use a spoon to mix both ingredients until the sugar dissolves. Step 3: Gently massage your skin using the scrub for 5 minutes. Step 4: Once all three steps are done, take in some steam. Steam helps you to relax your mind, skin and opens up your pores. Add a few drops of your favourite essential oil, drape a towel over your head and take the steam in for 5-10 minutes. To create a spa vibe, you can dim your lights in your room, light a few scented candles and play some soft music. Now for that nourishing glow, apply a face mask. It'll keep your skin moist, hydrated and radiant. Plus, it gives your skin a youthful appearance too. When choosing a facemask it's important to take your skin type into consideration. If it's oily skin, use a clay or mud mask, if it's dry, a mask that's creamy and hydrating would work. Combination skin needs a mix of these 2 masks. Whichever mask you settle for, wash it off after 15-30 minutes. Pat your skin dry using a towel. Moisturising is the final step here. After wiping off the face mask, apply some moisturiser or toner to your skin. If you have dry skin, you can use a heavier cream and if it's oily skin, then light or a water-based moisturiser should work. For sensitive skin, use only products that contain no chemicals, parabens or fragrances. Make sure to massage your face for at least 10-15 minutes. If you have a tan, tomato and buttermilk will help you get rid of it. Buttermilk keeps your skin moist, supple and baby soft too! Step 1: Take the pulp of one tomato and mix it with buttermilk. Step 2: After stirring, apply the mask to your face. Step 3: The mask should harden in 10 minutes. Step 4: Wash it off after 15-20 minutes. Honey and milk are a good combination for the skin. Both ingredients feel mild on the skin and work towards getting you a smoother, radiant complexion. Step 1: Drop 3 tablespoons of honey into a bowl. Step 2: Pour some milk and use a spoon to mix all the ingredients. Step 3: Add a teaspoon of white sugar. Step 4: Apply it to your skin and don't wash it off for at least 20-30 minutes. Eggs are packed with protein. Due to its astringent properties, eggs help tighten the pores and improving skin's texture. 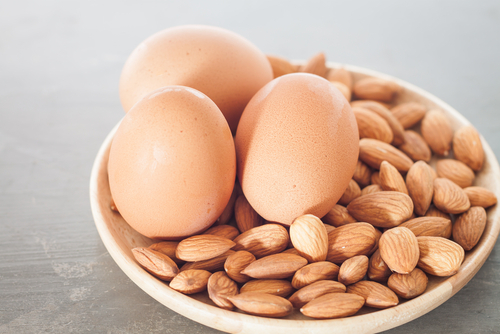 Plus almond oil is packed with vitamin E, A, protein, fatty acids and zinc. Step 1: Mix the yolk of 1 egg with almond oil. Step 2: Stir well and apply the mask to your face. Step 3: Leave it on for about 10-15 minutes before washing it off. Rose water is cooling for the skin and helps maintain skin's pH balance. It also has anti-inflammatory properties! 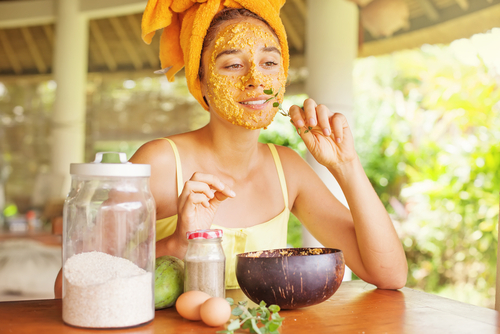 Turmeric, on the other hand, is responsible for clearing skin out and giving it a healthy glow. Step 1: Empty some turmeric powder into a bowl. Step 2: Pour some rose water and mix both these ingredients well. Step 3: Use your fingertips to apply the product all over your skin. Step 4: Spread the mask on your face using a brush or your fingertips. Step 5: Keep it on for 20-30 minutes. If your skin is starting to show early signs of ageing, then this mask is what you need in your life. 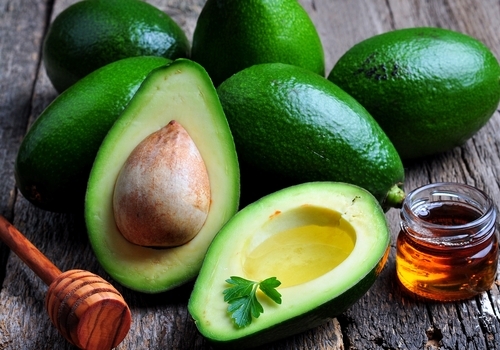 Avocado is rich in healthy fats and makes a healthy snack for your skin as well. Step 1: Scoop out the pulp on 1 avocado. Step 2: Drizzle some honey over it. Step 3: Toss the mix into a mixer. Step 4: Apply the raw pulp to your skin and keep it on for 30 minutes. Aloe vera gel has healing properties. When it comes to skin, this transparent gel is the best at protecting it. Containing abundant minerals and vitamins, your skin will thank you for it! Step 1: Take 2 large spoons of aloe pulp in a bowl. Step 2: Pour fresh cream over them. Step 3: Mix well using a toothpick. Step 4: Apply to your skin and don't wash it off until 15-20 minutes. This mask smells yum. As you know, strawberries have skin brightening properties and if you spot wrinkles and fine lines on your skin, this is the mask for you. Plus, yogurt helps to keep skin nourished and glowing at the same time. Step 1: Mash a few strawberries and add 1 tablespoon of yogurt. Step 2: Apply the pack on your face for 20 minutes and wash it off with lukewarm water. Step 3: Pat your face dry using a towel later. Did you know that one potato itself is rich in proteins, vitamins, fiber and minerals? Plus, it's packed with vitamin C which helps brighten skin naturally. 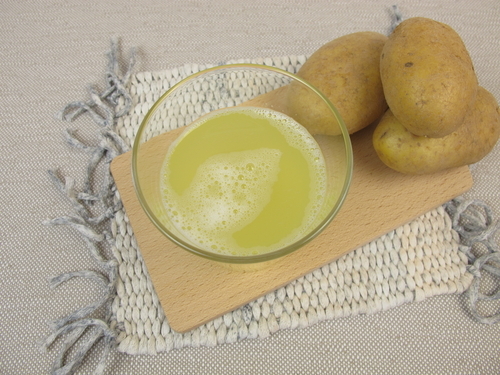 Step 1: Extract the juice of 1 potato using a grinder. Step 2: Add lemon drops to the juice. Step 3: Mix well and apply to the face. Step 4: Do not touch your face for 10-20 minutes. Step 5: Wash your face with lukewarm water. If you have tanned skin, it can be prone to nasty sunburns and rashes. Use cucumber juice to tackle this problem. The ingredient acts as a cooling agent and takes care of blemishes and marks like a pro. Step 1: Peel 1 cucumber and mash the veggie to get the pulp. Step 2: Squeeze the juice of one tomato over the pulp. Step 4: Rub the cool natural mask all over your neck and face and relax. If you have dull and oily skin, Multani mitti is your ingredient. It improves blood circulation and absorbs impurities from your skin as well. Plus, this mask will keep the skin cool and bright. Step 1: In a glass container, pour half a cup of tomato juice. Step 2: Add 2 tablespoons of Multani mitti. Step 3: A few drops of rose water later. Step 4: Use a wooden spoon to blend all the ingredients. Step 5: Apply the mask all over your neck, collarbone and face. Step 6: Only after 20 minutes should you wash your face. You should try to give yourself a facial at least get once a month. It'll keep your skin free from acne and make it super supple. When To Expect The First Signs Of Positive Results? As soon as you're done with a facial, the results are immediate. The glow lasts for 2-3 hours though. After that, it's your job to look after your skin till the next time you get a facial. Are There Any Side Effects Post A Facial? It all depends on how careful you are while doing a facial at home. If you're careless, you could harm your skin. 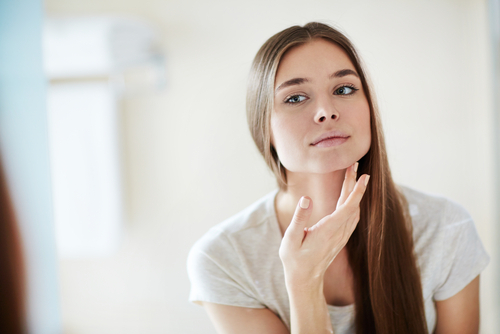 If you use a wrong ingredient or product, you could experience itchiness, redness, scarring and breakouts. Cold cream is what you can use to soothe the skin. If it still doesn't help, you may have to visit your nearest dermatologist. Old clothes in case you stain. To avoid stains, you can wear a tube or a tank top. If you're in a hurry, you can just wrap a towel around your body. -Avoid touching your face is the first tip. -Allow your skin to breathe and don't apply makeup until a couple of hours have gone by post the facial. -Drink lots of water and eat veggies and fruits; this will keep the glow longer on your skin. -Also, don't apply acid peels or retinol creams with your dermatologist being in the loop. Are There Different Facials For Different Skin Types? Yes, of course, there are! Every woman's skin is different and requires a special amount of attention. Normal Skin: Almost every facial will work with your skin type because it never experiences too much of oiliness or flakiness. Dry Skin: Cut down on the exfoliation. It does more harm than good for your skin. Opt for facials that are moisturizing and are creamy in texture. Oily Skin: Facials that are packed with oils can be avoided. The lighter, the better! Before applying a facial make sure to cleanse your skin first. Sensitive Skin: You need to be careful with sensitive skin. Gentle with the exfoliating, massaging and masking. Stay away from products and ingredients that contain parabens, chemicals and fragrances.